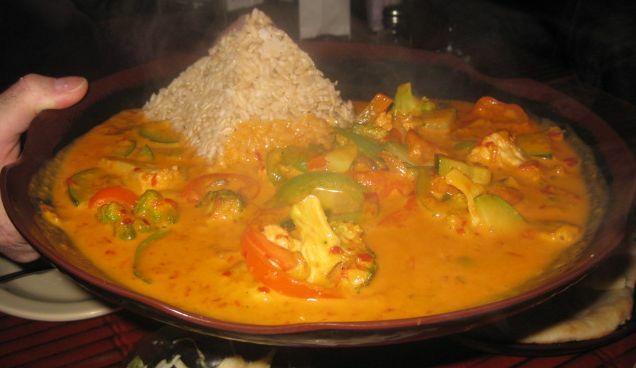 World Curry offers Indian curries and so much more. With varied curries from countries including Thailand and Singapore, this small restaurant in San Diego's Pacific Beach offers a take on curried cuisine that's worth a taste. 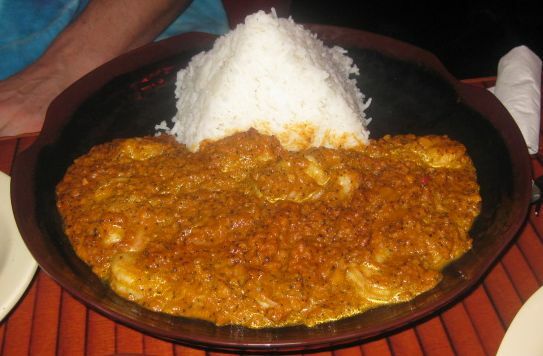 World Curry offers a smorgasbord of curry dishes from all over the globe. 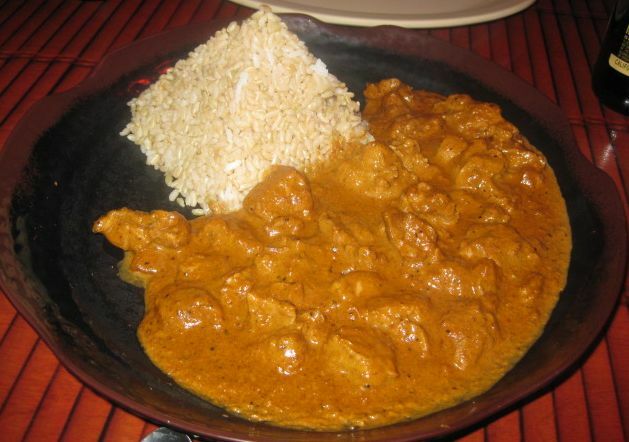 You can visit India with some Chicken Kheema while your dining companion delves into some Panang Curry from Thailand. It's something for everyone -- well, everyone who loves curry anyway (which should be a prerequisite for all of your friends, right?). This restaurant review opportunity sort of fell into my lap when we went to visit some of Nick's friends in San Diego. We were already planning to hit Tamarind of London on the way back to L.A., so I wasn't stressing about visiting an Indian restaurant while in San Diego. But when Nick's friends suggested this place on their own, well, that just shows that Nick has great taste in friends! The decor is as varied as the food. There are dragons and elephants and Buddhist artwork all mixed into the eclectic space. It's casual and has the charm of a hole-in-the-wall. We didn't have any trouble finding street parking out front, but from previous experiences in Pacific Beach, on most nights parking is probably much more difficult to find. Unlike many Asian restaurants, this one serves food entree style, not family style, with each plate coming with its own mound of rice. To order, you choose your heat level, then your protein (chicken, tofu, etc. ), and your rice (jasmine or brown, which costs $0.50 extra). We ordered a bunch of dishes and ate them family style anyway, by passing the plates around. We ordered a mix of sweet and savory curries. Sticking to the world theme, the restaurant offers beers from the same countries that the food is inspired by, including Japan, India, and Singapore. It was out of the two Indian beers on its menu this night but did manage to come up with a KingFisher. 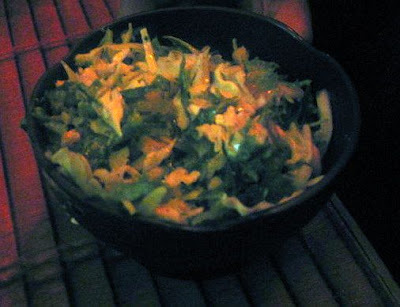 Each entree came with a Japanese-style salad, which I usually enjoy, but these were overpowered by the flavor of the dressing. I opted for what many people think of as an Indian curry, but here it was classified as from the U.K. Legend has it that Chicken Tikka Masala was created when a chef in the U.K. added tomato soup to tandoori chicken to satisfy a customer, thus creating the hybrid dish. I liked that the restaurant offers seasonal curries, in this case Pumpkin Curry for fall. I still need to come up with my own recipe for this, as I love the idea of getting a big serving of fiber and vegetables built into a curry dish. The vegetable Panang Curry (we got it medium) was the best of the curries. It was also the most distinctive. I do absolutely love Thai food though, so I may be biased. Once when I had been struggling with an angry stomach for a few days, the day I finally felt better was after we went out to eat Thai food. The Singapore Vegetable Curry was my least favorite. I loved that it had so many veggies, but it was pretty bland otherwise. 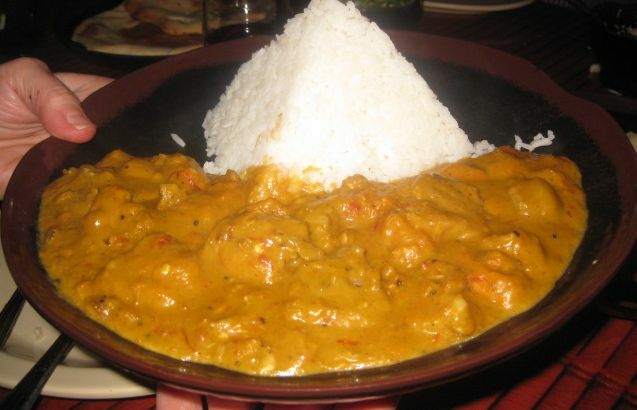 Nick ordered the Golden Curry Shrimp. To be honest, at this point all of the curries were sort of blending together on my palette, so I don't have any specific commentary on this one. I enjoyed my meal with a Lassi Frappe. I'm really not sure this was any different than a regular Mango Lassi, but maybe World Curry just wanted to give it a fancy fusion name. I asked the server what it was made of to see if that cleared it up, but it didn't (ingredients: milk, ice, mango, yogurt). It was a large size and was yummy, with some mango strands at the bottom that were especially great. 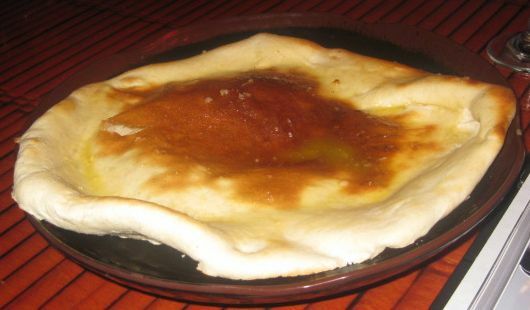 As a nod to India, the restaurant offers various naan options. We ordered a plain and a garlic. Everyone agreed that the restaurant offers a good value, with the regular portion of most entrees costing about $8 (the large portion for most is about $10). The Peppers consensus was between a 7 and an 8 and, since I don't give out half-Peppers (I figure that would just open up a hole other can of worms), I gave it a 7 because it's about two months later now and World Curry just isn't sticking in my memory as being terrific enough to break that 8 Pepper threshold. I do love the concept though and a 7 is still solidly Spicy on my scale! I love the idea that you can go there for lunch for a whole week and not have to eat food from the same country twice. 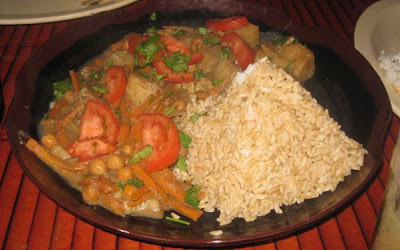 World Curry, 1433 Garnet Ave., San Diego 92109 (neighborhood: Pacific Beach). (858) 270-4455. Join saagAHH on Facebook and Twitter! Thanks for stopping by my blog, since it lead me to yours. Yes, Lisa and I went to high school together. Great review. I will add this to my "to try" list of restaurant. I used to live in San Diego and I still go back often to visit college friends.